The number 666 is found in Revelation 13:18 and is identified by the author as the number of the beast. Over the last 2000 years that number has become infamous. It is associated with the devil and evil. I have heard of people who would not accept a house number or license plate with the number. So what does this have to do with roulette? 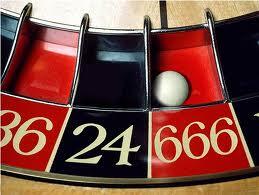 Well if you add up the numbers of a Monte Carlo roulette wheel they equal 666. As a result, the rumor has been that the inventor, Francois Blanc,cut a deal with the devil to get the design for the wheel. As most students of the New Testament soon learn, however, the mystery behind the number is Nero. If one add's up the letters of Nero's name in Hebrew the number equals 666. The video below is of Pete Watts of Bibledex, a New Testament PhD student at the University of Nottingham, and James Grime a mathematician at Cambridge University. In the video Pete explains how Greek and Hebrew used letters, not numbers, to add numbers and demonstrates how Nero was the beast. James shows some interesting facts about the number 666. Interesting fact: The video is 11 minutes 6 seconds long. 11 x 60 = 660 + 6 = 666. Question: my NA27 has the passage in question still in Greek, not the Aramaic. Why the proposed language change? Thanks. Because the Greek Gematria for Nero is 1337. Transliterating the name into Hebrew and then misspelling it by adding a second 'n' (nun) allows Preterists to manipulate it to equal 666. However there is another even more serious problem with the Hebrew Gematria for the Greek ‘Neron Kaisar’. The rules of Gematria dictate that when the letter Nun appears a second time in a word, it is known as a ‘Final’, and takes the value of 700. So to be precise, even the incorrectly transliterated NRVN QSR actually adds up to 1316 and not 666.
my NA27 has the passage in question still in Greek, not the Aramaic. Why the proposed language change?